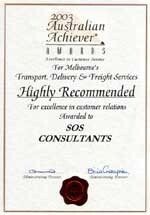 For the fourth year in a row, SOS Consultants receives an Australian Achiever Award! SOS Consultants has been "Highly Recommended" by the 2006 Australian Achiever Awards for excellence in Customer Relations. 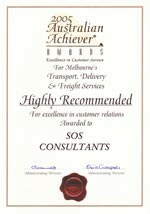 This is a particularly satisfying recognition of our commitment to customer service, following on from similar awards in the 2002, 2003, 2004 and 2005 Australian Achiever Awards competitions. If by doing our job we produce a result that makes our clients life easier, measurably more productive and profitable then we consider it a job well done. We do have a reputation for "bending over backwards" to provide value to our customers - it's a cultural thing, stemming from the fact that all our team come from a solid customer service background. 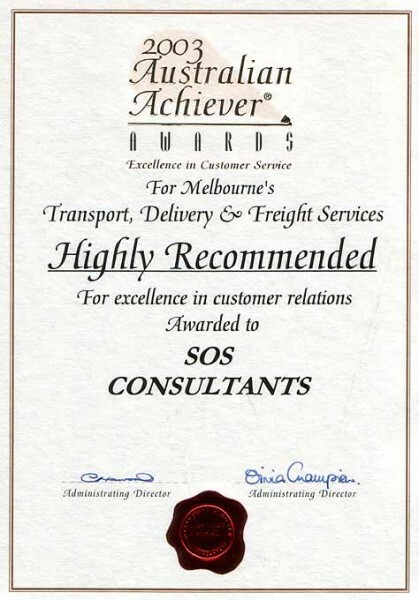 This has been proven recently when SOS was “Highly recommended" by The Australian Achiever Awards for excellence in Customer Service following the 2002 and 2003 judging. This is a wonderful accolade, which is awarded by an independent organization. 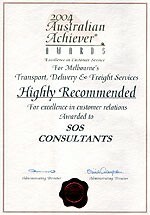 The Australian Achiever Awards based their assessment of SOS on the ratings and feedback received from our very own clients. 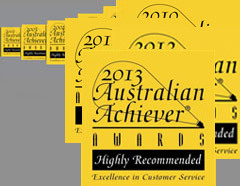 We believe this is an indication of our continual dedication to best practice and customer satisfaction. "They are small and give a better service that the large companies. Contactable 24/7. They are our life line." "Very satisfied with them. Very personal service. Good communication and excellent feedback. Very friendly and polite people." "Very friendly and will do anything for you. Very caring and treat clients with respect." We work with the best local and international companies who are ready and willing to embrace rapid growth and the culture change that comes with being proactive. Our associates within the USA, Primary Freight Inc., is an independently owned American corporation founded in 1996. In leveraging decades of Ocean Logistics experience, the company brings its customers a reliable, natural, customer service-oriented alternative to the shrinking list of viable ocean/air freight consolidators and operators within the USA. This has been proven by Primary Freight Services’ current ranking as number 2 in ocean exports in the Australian and New Zealand markets. A position that Primary Freight Services have held for the previous 14 Quarters.